The writing of a series of Sherlock Holmes stories in which the eponymous hero is a working class Teessider, living in modern day Middlesbrough, was very much a light bulb moment. The light bulb in question being an energy-saving, slow-acting affair. The events of this tale may vary slightly from the truth in sequence, but they are all true. Why wouldn't they be? It's not as if they are that fantastic, and not particularly bizarre if I'm honest. There's not much in the way of dramatic license here, just faded memories. So, there I am, on some unrecorded date, lying on the sofa running down episodes of Elementary on the Sky+ box with the singular accompaniment of a glass of Hardy's Crest, when the thought strikes me that although Elementary is a bit of a diversion from the original stories of Sir Arthur Conan Doyle. It's not a massive leap. It's set in contemporary New York and Watson is now Lucy Liu's Dr Joan Sherlock, but Sherlock Holmes, played by Jonny Lee Miller, is still a posh English fella who likes drugs and bees. And so, we have the first couple of watts of my lightbulb moment. Why didn't they take it further? To me the point in Holmes is that not that he's quintessentially English, it's that he takes a different perspective, that he's dark and unpredictable, and that he allows logic to override more human inclinations. Don't get me wrong I am a fan of Elementary, as I am on the BBC's excellent adaptation on this side of the pond, Sherlock. How could anything starring Benedict Cumberbatch and Martin Freeman not be brilliant, especially when Sedgefield lad Mark Gatiss has a hand in it. I also like the shows produced by Granada Television in the eighties and early nineties starring Jeremy Brett and Edward Hardwicke. Elementary, Sherlock and the older Sherlock Holmes stuff are all great television shows, with the more Conan Doyle-faithful GTV variants being perhaps my favourites. I just think there's a lot more to have a crack at. But where to you take Sherlock Holmes, where he hasn't been already? Sherlock in space? No. Sherlock the American? Definitely not. My decision was to take him to a place I know well. Middlesbrough. I’ve had other ideas for novels before. I’ve even taken these ideas to the point where I’ve written down a few paragraphs. The thing is that the seventy-odd thousand words that comprise a relatively short novel is a lot of story. I’ve not yet written a novel but I don’t think you could fit a story of that size in your head. Consequently, my idea for Holmes may have never made it into print had it not been for my inheriting a Kindle from my mum. Our kid and myself bought it for her few Christmases previously, but she never got the hang of it. She much prefers the traditional media of a paperback. Not having a great compulsion to buy a particular ebook I downloaded a few free titles including Captain Cook’s Journal, as you do, Aesop’s Fables, why not and The Adventures of Sherlock Holmes. The first, and to this date the only one I’ve read, being Sherlock Holmes. After reading the first story, A Scandal In Bohemia, it struck me that it was quite short, and therefore it was probably not beyond my capability to write a similar length story for my character. Whenever you tell people you are writing a book, it’s surprising how many people are also writing or have attempted to write a novel themselves. Very few have finished the process. I suspect because seventy-odd thousand words is a fair slog when you’ve got work and family and stuff to also do. A short story however is perhaps a different proposition. Something that is eminently doable. Zoom forwards, or perhaps backwards, to the 1st March 2014 and bar at the Garrison Hotel ahead of a particularly dismal one-nil away defeat to Sheffield Wednesday. To misquote the late great Brian Clough "If God had wanted us to play football on sand, he'd wouldn't have invented sodding grass." Anyway, there I am enjoying a pre-match libation with two of the Boro faithful, Andy Stevenson and Mick Richardson, when Mick mentions he is writing a book. I won’t tell you what his story is about in case Mick, myself or both get locked away. Suffice to say that knowing someone else was cracking on with their idea added the next couple of watts to the light bulb. Then we have a moment of destiny and sitting in Sherlock’s micropub, after some home game or other, and being hit with the dawning realisation that the pub was named Sherlock’s due to its sighting on Baker Street. At that point it just had to happen and shortly after I started work on A Scandal in Boro a loose pastiche of Conan Doyle's. A Scandal In Bohemia. It’s a little peculiar that the Baker Street area of Middlesbrough has subsequently become known as the Bohemian sector. That’s just one of few odd little coincidences that fell into my stories. Having read some of Sir Arthur’s work after writing my tribute there is a fair splattering of unintended synergy. It’s difficult to tell whether this is the subconscious at play or a shapes in the clouds scenario. Of course, life does place some limiting factors when it comes to imitating art, one of which being the length of Baker Street, Middlesbrough. Unfortunately, it runs out of doors long before we get to 221B. Not a problem, this is fiction and so is the invention of Holmes' new gaff, 22 Baker Street, Flat 1B. It's just above another made up place, Hud Couture, a fashion run by Holmes' landlady Mrs Martha Hudson. Then there’s the limitation placed by copyright law. One of the ideas I had was that Holmes would quote song lyrics. It the original stories he takes the odd passage from literature. In my more modern version this would become song lyrics from my eclectic collection of tunes featuring artists such The Charlatans, Thomas Lang, Isaac Hayes and the Arctic Monkeys. And then we have the last few watts of encouragement. Contributed by a proper author, John Nicholson, who took time out of his busy writing schedule to read my first four stories. Although he wasn’t too wrapped by the Holmes idea, and felt I should create my own characters, he assured me I had talent and if I put the graft in the potential for a career in writing. Who knew? It was perhaps this testimonial that provided the confidence to share my offerings outside my circle of friends and colleagues. Of course, Jonny had a point, but I had to finish the Holmes stories as I’d kind of grown fond to the little fella by then. There’s every chance that fans of the original Sherlock Holmes won’t take to my beer-swilling, foul-mouthed, anti-hero version, however if he’s nothing he’s original. Singularly unique, as the Sherlock Holmes of Sir Arthur Conan Doyle might say. Of course none of this would be happening without Gillie and Graeme the wonderful people at Sixth Element, who have taken my prose and are forming it into a book. To extend the light bulb analogy they are checking the wiring and fitting the lampshade. And what a fine job they are doing. 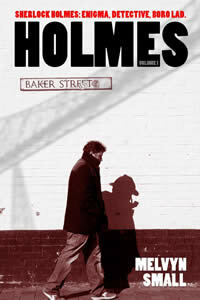 Sign up to the newsletter to be notified when the Holmes Volume One hits the shops.